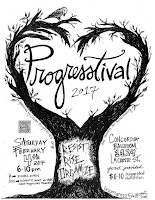 The PROGRESSTIVAL! will be held at the Concordia Ballroom, 1129 La Crosse Street, from 6 to 10 p.m. There will be food! and music, too. The event is open to everyone. Please plan to donate a little ($0 to $10) to help pay for the hall rent and other expenses. No one will be turned away for lack of funds! If you want to bring a non-perishable for local food pantries, please do. If you want to bring your neighbor, relative, co-worker, or friend along, please do! From 6:00 to 7:30 plan to visit with representatives from local, regional, state and national groups and organizations working to sustain and protect our important social institutions, vulnerable populations, our environment, our human and civil rights, and our democracy, Talk, connect, network, share ideas, and join with others to strengthen that community. Here's the list of confirmed groups. We will update regularly. Please spread the word. And check back often for an updated list of participating organizations.